Though a cheesecake can be savory (and served with crackers as an appetizer), most of us think of the term as describing a luscious, rich dessert. The texture of any cheesecake can vary greatly--from light and airy to dense and rich to smooth and creamy. All cheesecakes begin with cheese--usually cream cheese, ricotta cheese, cottage cheese or sometimes Swiss or cheddar cheese. A cheesecake may or may not have a crust, which can be a light dusting of bread crumbs, a cookie crust or a pastry crust. The filling is made by creaming the cheese and mixing it with eggs, sugar (for desserts) and other flavorings. The mixture is then poured into a special springform pan and baked. After baking, the cheesecake is thoroughly chilled and generally topped by sour cream, whipped cream, fruit or some other embellishment. 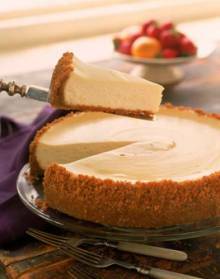 Thanks to American ingenuity, cream cheese--the most popular ingredient for cheesecake--was developed in 1872. The appellation comes from the smooth, creamy texture of this mildly tangy, spreadable cheese. The soft, unripened cheese is made from cow's milk and by law must contain at least 33 percent milk fat and not more than 55 percent moisture. Gum arabic is added to some cream cheese to increase firmness and shelf life. American neufchâtel cheese is slightly lower in calories because of a lower milk fat content (about 23 percent). It also contains slightly more moisture. Light or lowfat cream cheese has about half the calories as the regular style and nonfat cream cheese has zero fat grams. The easily spreadable whipped cream cheese has been made soft and fluffy by air being whipped into it. It has fewer calories per serving than regular cream cheese only because there's less volume per serving. Cream cheese is sometimes sold mixed with other ingredients such as herbs, spices or fruit. Refrigerate cream cheese, tightly wrapped, and use within a week after opening. If any mold develops on the surface, discard the cream cheese. Place completely unwrapped packages of cream cheese in microwavable bowl. Microwave on High 30 to 45 seconds or until slightly softened. Don't overbake the cheesecake. When perfectly done, there will still be a two to three-inch wobbly spot in the middle of the cheesecake; the texture will smooth out as it cools. Cheesecakes have a tendency to crack, but they don't have to. This favorite American dessert can have a cracked surface for a number of reasons. One cause is air trapped inside the batter - a result of over-mixing. Once in the oven, the air bubble expands and wants to escape from the cake. As it finds its way out of the top of the cake, it creates a crack or crevice in the cake's surface. Another cause of a cracked surface is a drastic temperature change. Also, be sure to cook your cheesecake gently. Use a water bath - wrap the bottom of your springform pan in aluminum foil and place it in a larger pan with water in it, just halfway up the outside of the springform pan. This will allow the cheesecake to cook more slowly and evenly. Finally, cook your cheesecake slowly - at 325º F. After about 45 minutes, turn your oven off and leave the cheesecake inside the turned off oven for another hour. Cool at room temperature with a plate or cookie sheet inverted over the cheesecake to slow the cooling. Only then can you refrigerate the cake, which you will need to do for another 6 hours at least. Cheesecakes with cornstarch or flour added to the batter do not crack as easily from overbaking. The starch molecules will actually get in between the egg proteins preventing them from over-coagulating. No over-coagulating, no cracks!! Some bakers add extra insurance to a cheesecake recipe that doesn't contain cornstarch or flour, by simply adding 1 tablespoon to1/4 cup of cornstarch to the batter with the sugar. With today's trend to produce larger and higher cheesecakes and to bake them without the benefit of a waterbath, they tend to overbake at the edge before the center of the cake has reached the temperature necessary to set (coagulate) the eggs. Here, your cheesecake will tend to form deep cracks upon cooling. Don't bake your cheesecake at too high a temperature (I recommend baking cheesecakes at 300-325 degrees F at the highest) The egg proteins will overcoagulate from too much heat which eventually shrink when cooled, causing cracking usually in its center or tiny cracks all over its top. If you heat it up to fast or cool it down too fast you're also going to get cracks. Cheesecakes can be frozen. Careful wrapping is very important. To freeze, place a fully cooled cheesecake in the freezer, uncovered, for 1 hour. If it's in a springform pan, remove sides of pan and freeze with the pan bottom in place. After 1 hour, use a knife to separate the cheesecake from the pan bottom. Slide it onto a foil-wrapped piece of heavy cardboard. Wrap in plastic wrap, then carefully place it inside a large freezer bag or wrap it in heavy duty aluminum foil. Label and date. Freezing for more than a month is not recommended to retain the best quality. For a cheesecake with topping, such as fruit, always freeze cheesecake WITHOUT the topping and add the topping before serving. Always thaw a cheesecake overnight in the refrigerator. When partially thawed, transfer it from the cardboard bottom to a serving plate. A "water bath" is a method that will help keep your cheesecake from cracking while baking. Bake cheesecake as directed. When cheesecake is done, remove springform pan or cheesecake pan (if using) from "water bath" in oven. Carefully remove larger pan with water in it from oven. It will be very hot. Discard water when it has cooled.